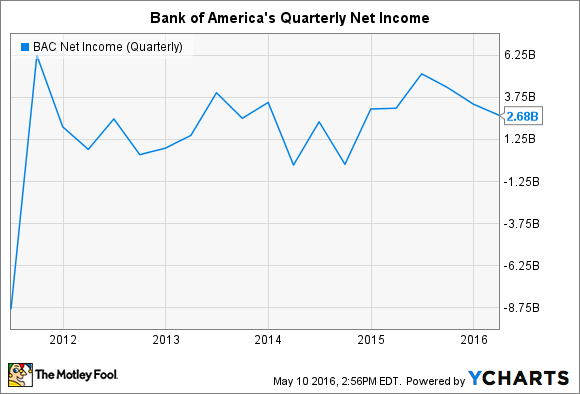 How Much Should Bank of America Be Earning Right Now? This isn’t hard to figure out. Most investors in Bank of America (NYSE:BAC) probably know that the nation's second biggest bank by assets isn't earning as much as it should be right now. But exactly how much it should be earning is less clear. I believe the answer is a minimum of $5.5 billion a quarter. This refers to Bank of America's net income applicable to common stockholders. The distinction matters because it subtracts the $300 million to $500 million the North Carolina-based bank pays in dividends on preferred stock each quarter. Not excluding these payments would make Bank of America appear more profitable than it actually is. How did I come up with this figure? It equates to 1% of Bank of America's average assets -- that is, the average cumulative value of its assets throughout the first quarter of 2016. This is a common benchmark in the industry, as a bank that generates a 1% return on assets is said to be creating shareholder value as opposed to destroying it after factoring in the opportunity cost associated with forgoing safer investment alternatives, such as risk-free government bonds. According to Bank of America's most recent earnings release, it had total average assets of $2.2 trillion last quarter. Multiply that by 1%, and you get $22 billion. That's how much Bank of America should be earning on an annual basis. By dividing this figure by four, we get $5.5 billion, which is how much it should be earning on a quarterly basis. It may go without saying, but this is more than Bank of America is currently earning. In the most recent quarter, its net income applicable to common shareholders was only $2.2 billion. That equates to a return on average assets of only 0.5%, or roughly half of what it should be. And last quarter wasn't an exception. The most Bank of America has earned in a quarter over the last two years was $4.8 billion in the second quarter of 2015. More commonly, it's posted earnings in the neighborhood of $3 billion a quarter. And, of course, it's reported its fair share of quarterly losses, doing so twice in 2014 alone. NOTE: The net income figure in the chart doesn't exclude preferred stock dividends. Data and chart by YCharts. Bank of America's salvation will come from two sources. First, higher interest rates will boost the income it earns from its loan and securities portfolios. In its latest quarterly filing with the Securities and Exchange Commission, for instance, Bank of America estimates that its net interest income will increase by approximately $6 billion a year if short- and long-term rates rise simultaneously by 100 basis points, or one percentage point each. Second, as Bank of America continues to distance itself from the financial crisis, its debt rating should improve. This should translate into lower borrowing costs. On an annualized basis, Bank of America pays a 2.39% interest rate to borrow $234 billion in long-term debt. By contrast, if it paid the same rate on long-term debt as the higher-rated Wells Fargo -- that is, 1.56% -- then Bank of America's annual interest expense would decline by approximately $2 billion. In sum, it's impossible to say how long it will take Bank of America to earn $5.5 billion a quarter on a consistent basis, but one thing we do know is that its ability to do so boils down largely to interest rates -- with respect to both how much it earns on its assets and how much it pays on its liabilities.